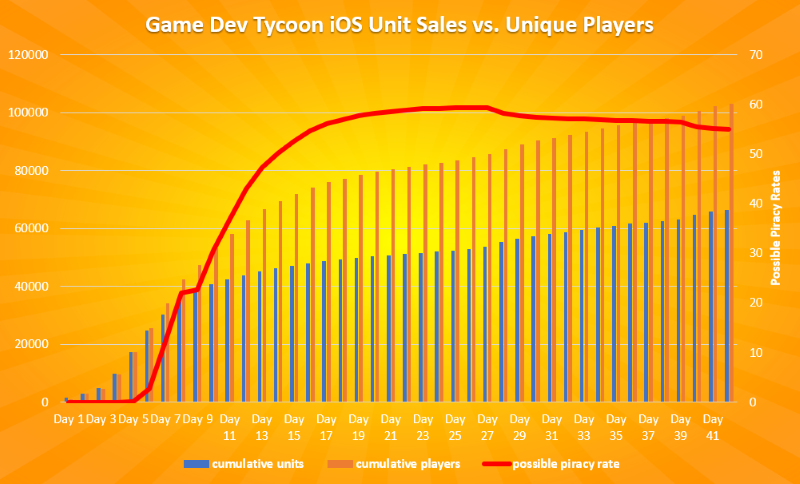 This is part 4 of our Game Dev Tycoon mobile release analysis. Happy New Year, everyone! Before we get into the latest data from the iOS release (spoiler: lots of good news! ), I wanted to give a quick update on the Android and PC update. We started Beta testing Android just before Christmas by inviting testers through our newsletter. The interest has been absolutely astonishing – we received 1,300 applications within 3 hours (!) and over 2,500 applications overall. For comparison, our iOS Beta test received 625 applications so the interest in Android was four times as much. Thanks to everyone who signed up we now have a good spread of devices and Android versions to test and the test has been going pretty well. We don’t have a firm release date yet but still plan to release this month. Stay tuned! Before Christmas, we published a Beta version to Steam which includes the new pirate mode. Our intention was to gradually port the rest of the features (new topics, story update and UI tweaks) to the Beta but the UI tweaks were so extensive and intertwined in other changes that we now plan to publish all of these features together (including updated modding support). We should have this ready for Beta at the time of the Android release and ready to be released as a general update (on Steam and elsewhere) a few weeks after that. Now, onwards to the iOS report. We didn’t get around to writing part 4 before Christmas but now that the new year has started, we have even more data to show. 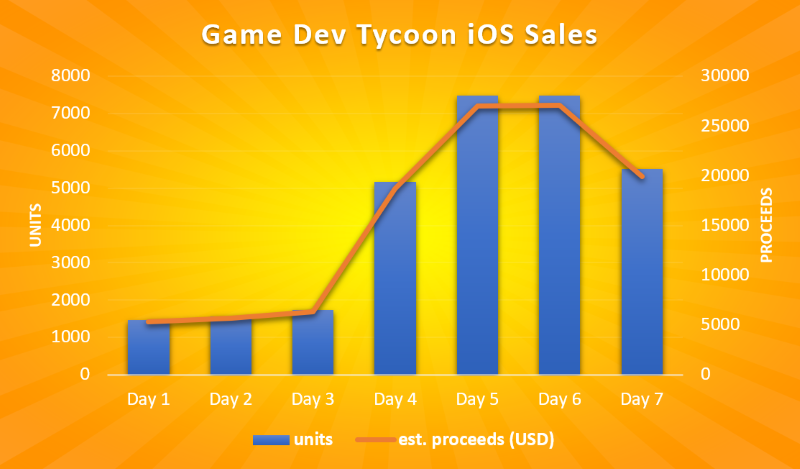 Here is our latest sales graph showing 42 days on the App Store. As you can see the feature gave a massive boost which lingered for about a week before sales fell quite dramatically to the lowest levels so far. Thankfully, the downward trend didn’t last long as Christmas Day gave a boost again and resulted in better sales throughout the holidays. 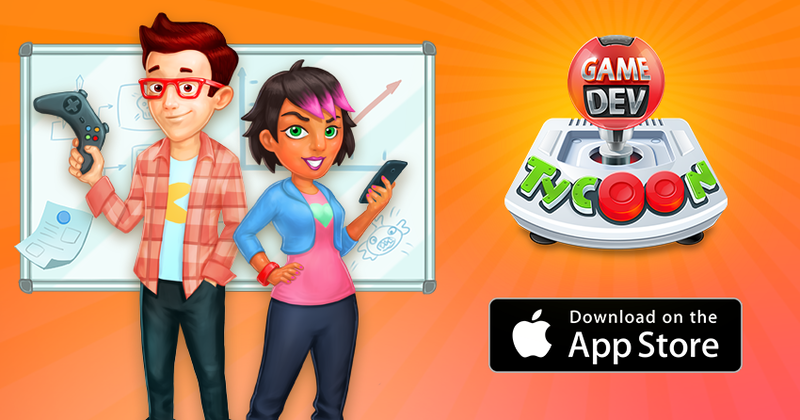 We hope Game Dev Tycoon provided some relaxing holiday gaming! The new year started off well too with several feature placements in Europe (UK, France, Belgium) providing another spike – albeit much, much smaller than the first one – near the end of the graph. 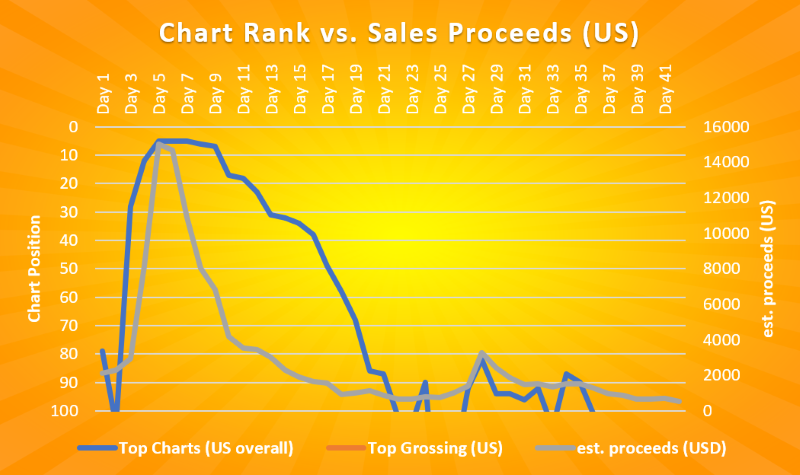 Above you can see the chart positions (according to AppAnnie) and proceeds in the US market across the 42 days of sale. During the Game of the Day feature we made it to the Top 5 paid position for three days which was our best position and consequently resulted in the largest sales. Our best position in the Top Grossing charts was at position 265 which explains why the Top 100 Grossing charts barely ever have any paid apps in them. Freemium simply dominates the market. What’s also interesting is just how steep sales fall once you step down the chart ladder. 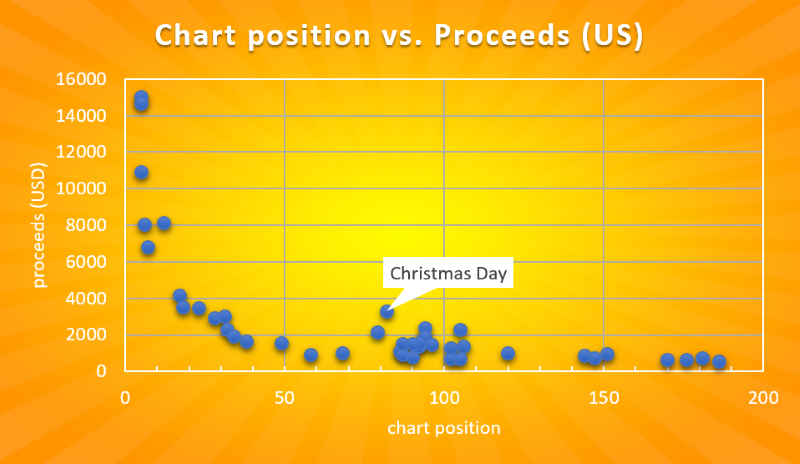 Below you can see the proceeds plotted against the chart positions. At position 5, our best day, we saw around 15K proceeds. At position 6, only one step down(! ), we made just half of that (53%), at position 17 we made only a third (27%) and once you hit the low 100s we were looking at around 4-6% of what we made on our best day. Interesting outliers are due to generally increased sales during the holidays and weekends. On Christmas Day for example, we were at position 82 but this still saw around 22% of what we made on our best day. While the difference in the Top 20 charts is simply massive, the difference in the lower numbers isn’t quite as dramatic. Our worst chart position at spot 186 had still about 86% of the sales of what we saw at position 102 so while it’s true that the very top paid apps make the majority of the sales, you can still make a sizable income at the lower end of the charts if you manage to hold your position over multiple weeks. Our ratings on the App Store are still great with an overall rating of 4.8 and an incredible 4.9 in the US (beaten by Australia which sits at 5.0 at the moment). We are slowly trending towards a 4.9 overall which is just incredible. On the review side, Game Dev Tycoon has now a Metacritic rating of 89 and shows up as the Top #11 iOS game of 2017. It’s truly humbling to see just how much players enjoy our game. I’m also happy to say that most 1-star reviews are now based on opinion rather than technical issues so it seems that our latest patches have fixed nearly all problems with the game. With all the good news out of the way, let’s take a look at some bad news. While we were stunned to see that iOS didn’t show any signs of piracy initially, we are now fairly confident that there is sizeable piracy at work. 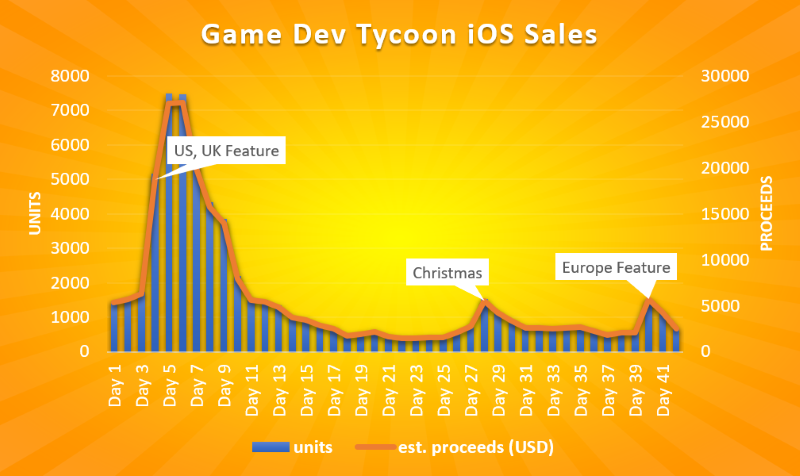 For a while Game Dev Tycoon was listed in the Top spot on several iOS piracy sites and it shows when we look at our usage data. What you see above is a chart comparing our confirmed sales numbers with the number of unique (but anonymous) users our analytics software tracks. The difference between those numbers is a simplified view of potential piracy. As you can see the difference was zero for almost 5 days but once the Game of the Day popularity kicked in we can see a massive rise in the difference and for the last two weeks we see a fairly steady discrepancy of around ~55%. The latest data suggest that we have over 100K players, compared to around 66K sales. Disclaimer: As I mentioned before, this is not to say that we have a guaranteed piracy rate of 55%. One legal purchase could be used on multiple machines (either through multiple devices by one person or through family sharing) but on the flipside, pirated versions could also block our tracking completely so there could be a much larger number of players that we simply don’t see. What is clear though is that piracy exists on iOS and is likely substantial. It’s much easier to accept the effects of piracy once your product is profitable but I really wonder how the mobile market would look like if piracy of premium games was lower. Perhaps the Top Grossing lists and market direction wouldn’t so heavily favor freemium games? It will be interesting to see how the Android release will compare. Thankfully, we won’t have to wait long to find out. You can comment on this blog post on our forum, here.